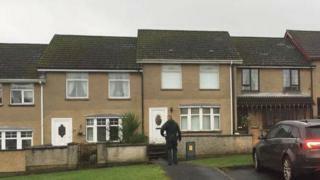 A security alert which led to several homes being evacuated in Londonderry overnight has ended but a man arrested near the scene remains in custody. The alert began following the discovery of a suspicious object in Ederowen Park, Galliagh, on Wednesday night. Officers from the PSNI's Terrorism Investigation Unit arrested the man after searching a property in the park. They said the 39-year-old man was detained in connection with "violent dissident republican activity". A number of items were found during the search and have been taken away for further examination. Several residents spent the night out of their homes as a result of the security operation. Some of them took refuge at a local community centre but were allowed to return home on Thursday morning. "It was absolutely freezing and many families with small children had to leave their homes," said SDLP councillor Brian Tierney. Sinn Féin councillor Sandra Duffy said it was very upsetting for elderly residents and young families. Det Insp Heaton said: "Residents who were evacuated during the operation have all returned to their homes, and I want to thank the public for their patience and understanding during this operation as we worked to bring it to a conclusion."